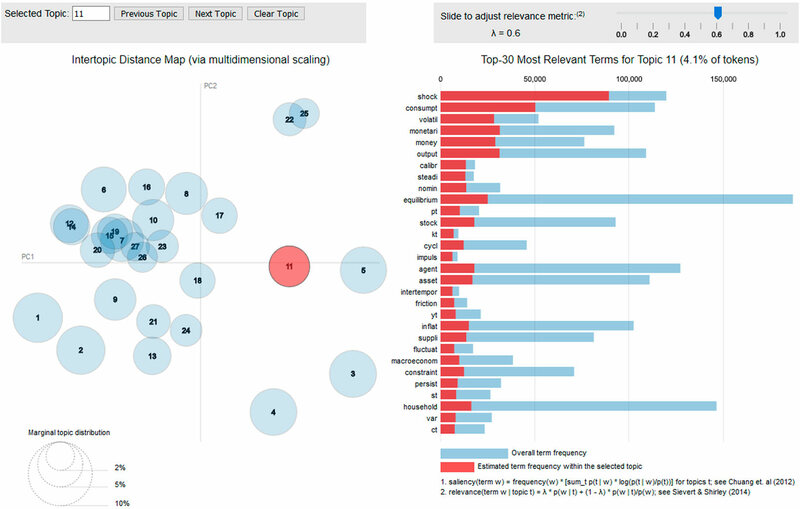 Applying topicmodeling to a corpus of economic journals can reveal a lot about what economists talk (or write) about and how they select and link the prevailing subjects in the scientific debate. Our original application of the LDA algorithm allows to grasp the evolution of knowledge in economics over more than a century of scientific publications. The paper, join effort of reseachers at Despina Lab - Department of Economics and Statistics, offers a fundamental novelty in the approach: first, in considering the full text of economic articles (under the ‘bag of words’ assumption), rather than citations, bibliographical references, metadata, or any other specific feature. Second, in the change of perspective offered by the automated, unsupervised nature of topic detection, creating the possibility of revealing the latent, hidden – and otherwise invisible – structures of economists’ works.